Following just a day after we reported that Anheuser-Busch had placed the largest pre-order yet for Tesla’s new Semi Trucks — with reservations being placed for 40 units — Sysco Corporation has announced that it has reserved 50 units of the upcoming Tesla Semi Truck. Sysco Corporation, for those unfamiliar with it, is one of the very largest food service distribution firms in the world — handling the supply needs for a vast proportion of the food service industry in the US (and elsewhere). The pre-order for 50 units of the Tesla Semi Truck from Sysco is a very notable one. This order vaults the tally for public Tesla Semi reservations up to ~166 — a fairly large number considering how untested the tech is in the real world as of yet, how long out production is, and the fact that a fairly large deposit has to be put down to reserve one. It was one thing to see that kind of early consumer enthusiasm and reservation tally for normal consumer products (the Tesla Model 3, for example), but a bit less expected in such a numbers & spreadsheets industry. Tesla no doubt appreciates the extra working capital provided by the reservations (even if as of yet it isn’t a huge figure). 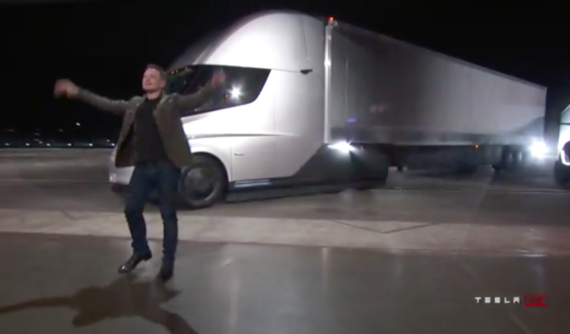 As a reminder here, the Tesla Semi Truck will reportedly possess a single-charge range of ~500 miles; an 80% recharge in just 30 minutes; and the support of a planned global “Megacharging” network designed specifically for the electric semi truck sector. Production of the Tesla Semi Truck is expected to begin in 2019.
it runs ~300 distribution facilities. Needless to say, Sysco represents a serious potential customer for Tesla (or any other heavy-duty truck manufacturer).